Zach discusses shanks — how to recognize them, what causes them, and a drill to eliminate them. • Conventional shanks are caused by hitting balls off the right part of the hosel (nearest the club face), sending balls low and right. • Straight shanks are caused by hitting balls in the center of the hosel, sending balls low and straight. Straight shanks mimic — and are frequently confused with — topping the ball. • Pull shanks are caused by hitting balls off the left side of the shaft, sending balls left. Zach demonstrates the Two Ball Drill to eliminate shanks. “Shank! 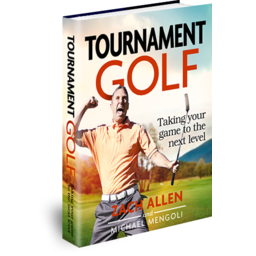 The Cure for Golf’s Most Debilitating Shot” now available! 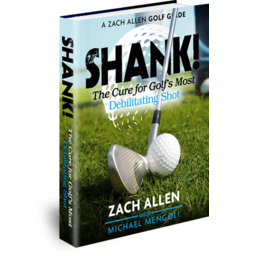 Your Never Shank Again video is probably the best shank cure lesson I have ever come across. I am a 9 handicap and get the shanks from time to time. I understand the drills I need to do to cure it (e.g., 2 balls, using an empty box, etc. )… but I have always wanted to understand what in my swing is causing it and I rather fix the probllem at the source. Your video was very clear and mine was a typical inside takeaway, resuting in a downswing that is coming from the top or outside the line. I have fixed my shanks and shot 2 clean rounds with confidence. If it happens again, I will at least understand the cause. Many thanks for your video and the help. Thanks so much for the feedback, Jim! Zach, thank you for your excellent YouTube video on curing shanks. I hit several shanks and shot a 97 and then watched your video and have four rounds in a row with no shanks and all scores in the 80’s. I have watched many videos on shanks and your cure is by far the most effective. I have also had lessons with at least 3 pros and discussed shanks and again your video has really been the only effective fix – I have had a problem with shanks for the past few years. I cannot thank you enough for your excellent instruction. Tim, I’m pleased the video helped. Thanks for the feedback! Thanks ever so much for the video. 2 pros have been unable to stop the tom hanks for me and this video has done it in one simple session. Zach, the shanks hit me in the middle of a competition a few weeks ago. They were so bad I pulled out of the next comp. as it felt as if all my confidence had drained away. I tried a few drills on the practice ground with mixed results but still couldn’t get back out on the course. I tried your method the other night and not only hit straight shots again, but hit them with confidence. Thank you so much. When I do this drill, I shank the ball that is farther away from me. So, what I do, is address the closer ball and swing at it. I wind up hitting the ball farther away from me, pure and long. Of course, you don’t have the luxury of the two ball drill when you are out there playing a round. So, what I do is to pick an imaginary spot and address it, a spot that is away from the ball and closer to me. That cures the shanks for me. But, you cannot just pull the club closer toward you, because your brain is telling you that the ball is farther from you so reach for it. Shank! You have to focus on the imaginary spot that you are addressing with the club face. Thanks for this. I thought I had cured this year but it comes back. What reason would there be for me to only shank my SW and 60 degree wedge? I really don’t shank any other clubs. After I posted my comments last month, I asked my club pro for help. He observed that I was not taking the club back along the target line, something that Zach addresses in the video. I was taking the club back to the inside too quickly, forcing me to come outside-in on the downswing. My guess is that the SW and LW, being the shortest shafted clubs, are more difficult to takeaway along the target line if you are not deliberate in your backswing. It is a lot easier to take away longer shafted clubs along the target line. My shanking problems have always begun with the shortest shafted clubs, namely the wedges. So, when you are on the course, do you set up and ground your club where the imaginary second ball would be? That is exactly what I do, and I keep my head down, looking at that spot on the ground. But, that is a band-aid, not a solution. Since I wrote that last September, I have worked tirelessly with my club pro to eliminate the fundamental cause of the shank, and that is my posture. I tend to rise up out of my stance on the back swing, causing by arms to fall forward toward the target line on the down swing as I try to regain my balance. That results in my striking the ball on the hosel. So, we are working on rotation of the upper body into the back swing and a folded right arm to maintain proper posture and balance. Now, I find myself placing the club face directly behind the ball once again. Zach I an11 hcb and started shanking pitching wedge only. Get approach to green on regulation then pitcher shanks it only started this about 4 weeks ago. Will try ur drill and let you know if it works. Your explanation of what a shank is and what causes it is the best I’ve seen. I play with golfers that would not believe me when I told them that shanking wasn’t just hitting the ball on the inside of the hosel but can also be caused by hitting the ball square on the center of the hosel or even on the outside of the hosel. There was a time when I was convinced that I was swinging what I was holding (the shaft) at the ball. You have changed my attitude about curing my shanking and I’m thankful for it. i was practicing in my net for a while recently because my golf game had disintegrated rapidly. I went from 15 handicap to 19 and now i am at 18. For a while i worked my swing out and started getting consistent hits . Then rather suddenly i started shanking almost every shot. i couldn’t hit a wood without topping and slicing etc. Panic crept in and frustration and i haven’t been to a course out of fear. i watched your video yesterday and went back to the net last night and this morning and hit several hundred balls practicing the take back( the rehearsal swing ; out on the back swing and in on the down swing) and weight on the heels and unbelievable for me i hit 2 shanks only. Also all my golf shots were of better quality and consistency. i am pretty excited again and tomorrow i am playing a round of golf on the course and am confident again. naturally i don’t expect to have the best round ever, but i think i will start enjoying my rounds more. Thank you so much. Your video explained to me why i shank and how to overcome and its absoluteley amazing how well you tutor it. i have signed up for your newsletter and hopeful will improve other aspects of my game to. I had the shanks bad with every iron in my bag…..looked at all kinds of advice and nothing seemed to work. I started experimenting and here is what I came up with. I use an exaggerated closed stance. The toe of my right foot is even with the heel of my left foot. I changed my stance to very narrow, feet are 8″ apart, and I play the ball from off my left heel regardless of the club I am swinging. From that stance I take my normal swing. I noticed immediately that I could rotate easier on the back swing. I haven’t shanked a ball since and I hit the ball in the middle of the club face. Ball is perfectly straight 90% of the time, I only occasionally pull a shot and that comes when I swing too hard. I also gained about 1/2 club length. Sounds weird and unconventional, but it works. I am convinced that no one thing works for everyone, we play a strange and very individual game. I very much enjoyed the video. However I’ve yet to be able to cure mine which have consistently infected me for about 20 years. I cannot go more than two rounds of golf before they come back. I’ve done every drill in existence. Unfortunately I defy just about all common laws of physics with regards to shanking. For example, the classic board/shoe box/head cover drill where the object is placed just outside the ball to prevent you from swinging out to in or too in to out for that matter…both will hit the object. Well, I’ll miss the object and still shank. So I worked on this drill….and just about every time I shank the inside ball. It’s funny how golf is so precise and we all are amazed at how pros can hit the sweet spot or very close to it, every time. Well, the hosel is a very small part on the club too, but I can hit it every time with no effort. I can effortlessly shank the golf ball every swing without any thought. So, shanking coming from an outside to in swing with a closed face is most common. But what drill helps those of us who also shank from coming too inside to out with a closed face? Hey, l really liked your video…just think people elated with this are those lucky “from time to time ” shankers and not the in the big house like myself. Kevin, I feel your pain. If you have read all of the previous replies that others have posted to the shanking problem, you will see that I have added a couple of replies back in 2014 and 2015. Like you, shanking plagued me for years until I addresses the problem head on. I began to use an impact label on the face of my wedges and irons to identify the impact point. What I found was that the impact mark was consistently toward the heel of the club or on the hosel itself. Nothing that I did could cure the shanks because my swing path was the cause of the problem, and I struggled to correct my swing path. The only way that I could consistently hit the ball without shanking was to address the ball with the face of the club pulled back toward my body by one width of the club face. If you do that, your playing partners will wonder what the heck you are doing, but it works when nothing else does. The ball flight and the mark on the impact label tell the story. After a lifetime of shanking, I have not hit one shank in over 200 rounds of golf over the past two years.